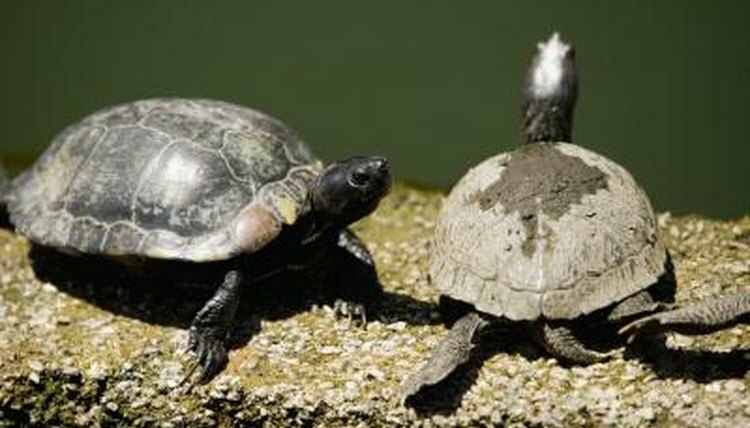 Pet owners may be understandably alarmed to find a black, dark gray or purple organ protruding from the underside of their turtle's tail, but this sack-like black material is usually nothing to be worried about. It is, in fact, the reproductive organ of a male turtle, which is normally hidden within the cloaca until it's ready to be employed. If you see this organ coming from your turtle, you can feel confident about his gender. Turtles have a more complex reproductive system than may be evident at first glance, especially in the case of male turtles. Most of the time, the male turtle's reproductive organ remains tucked into the cloaca, a vent under the tail that serves as access to reproductive organs in both sexes, as well as an outlet for waste products. This organ in the male is quite extensive, relative to the turtle's body size; in some cases it can reach a length of half of the turtle's plastron. Turtles, like many other animals including mammals, have what is known as a hydraulic intromittent male reproductive organ. This means that when the turtle prepares to mate, or in other situations where it becomes physiologically aroused, the erectile tissue of the organ becomes engorged with blood and increases in size, supported by collagen fibers. In the case of turtles, this means that the organ protrudes from the cloacal vent, first underneath and alongside the tail and then, as the turtle's organ continues to expand, more vertically under the body. According to Scientific American, this organ can expand nearly 50 percent in length and 75 percent in width. There are many reasons why a male turtle's reproductive organ may be protruding from its cloaca. Most obviously is that the turtle is preparing to mate with a female. However, there are also other situations that may see the turtle's reproductive organ protrude from the cloaca, including general agitation or excitement, muscle control problems, constipation, infection, urination and defecation. Most of the time there's no cause for concern when a turtle's reproductive organ is outside of its cloaca -- as long as it can be retracted back. Sometimes, however, the phallus cannot be voluntarily retracted due to injury or swelling. This is referred to as a prolapse. If the phallus cannot be retracted, then the turtle is at risk of potential life-threatening injury to this sensitive organ. Monitor your turtle, and if the organ does not retract back into the cloaca on its own within several minutes, consult with your veterinarian. If your turtle is housed with others, remove him from the enclosure while the organ is prolapsed to avoid other turtles biting or scratching it.